Last August (August Break 2011) I bought a copy of Baked in America by the Davids [Outsider Tart]. This August I am showing you the Boulder Bundt Cake (pg 144) from said book. If you are a coffee/toffee lover this is the cake for you! It's amazing. My bundt/tube pan wasn't big enough and it was overflowing and a tiny part of it at the top was under done, but it is amazing. I love coffee flavored stuff and this has hit the spot! If you have the book then by default you own the recipe and if you have trouble finding coffee extract as I did, no worries, just make it yourself!! 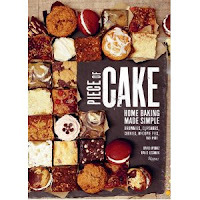 I am sorry that I am not sharing the recipe with you, but I have already shared a few recipes from this book. I have my own rules of sharing recipes from books. I really love this book, it's one of the few I have baked a lot from. It's an all around good book has a little bit of everything you would ever need! That loks so good, and the description sounds like my kind of food. I want that for breakfast with my morning coffee!